When my nephew Kam spends the night at our house, this is how he emerges from Joey's bedroom. Every. Single. Morning. 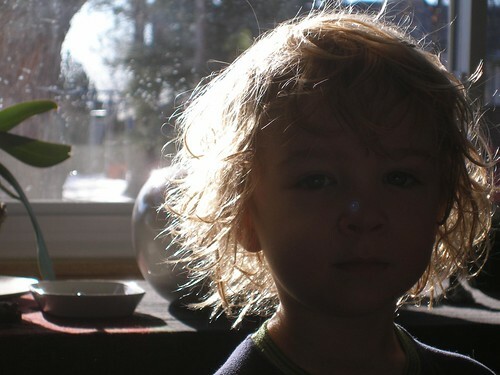 I love how the morning sun lights up his hair like this. 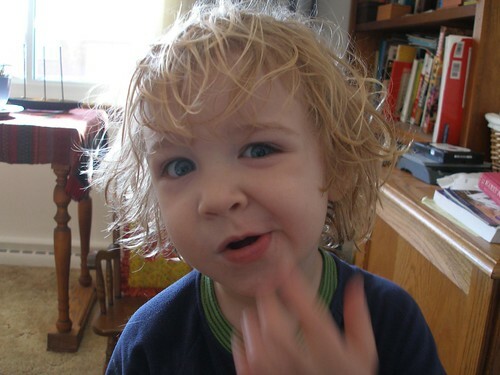 And this one was from a bit later as I let him play with my camera. He was very specific about what face I should be making for the pictures he had planned. Sadly, I failed to meet his expectations. Note- I want to shout out a huge apology to anyone who has commented in the last couple of weeks. Apparently I'd changed an important setting and all comments needed my approval. And with more disastrous results, I also managed to turn off the email notifications that I had comments pending. So all your wonderful words have been sitting in comment limbo for the last 2 weeks or so. You think I would have suspected something and started poking around blogger, but I just assumed that no one loved me anymore. It took a friend living in France to point out my ridiculousness. Thank you much, Karin! And thanks to the rest of you for still continuing the conversation, even if I was temporarily mute to it. No apology needed here - you did still visit me and comment, so I knew you were out there somewhere! I think both everyone, including Kam, prefers his hair longer. Though, after he watched Raven shave her head for St. Baldricks, he's thinking about doing that next year. You take care and glad to see that we can all converse again. Yay!